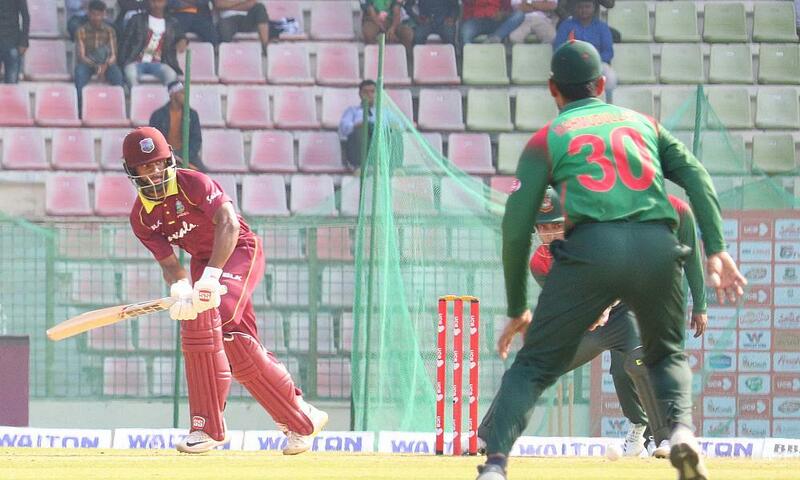 The WINDIES lost the 3rd One Day International by 8 wickets and the series 2-1 against Bangladesh at the Sylhet International Cricket Stadium in Sylhet. Rovman Powell lost the toss for the first time in three matches, Bangladesh immediately elected to bowl first, remembering the first ODI, which saw the WINDIES capitulate for less than 200. The WINDIES had one change in the squad, with Fabian Allen replacing Oshane Thomas who was rested and the pitch appeared to favour a spinner over a seamer. Chandrapaul Hemraj once again found it difficult to score in the opening powerplay overs. Despite stroking 2-fours, he was soon out for 9, caught off Mehidy Hasan when he tried playing the same cut shot twice in succession. Darren Bravo joined Shai Hope at the wicket and the pair started a cautious rebuild of the WINDIES innings. Bravo used 26 deliveries to score his 10 runs before he saw his stumps fall to Mehidy. Marlon Samuels struggled once again in the scoring department, however, he was the highest scorer after Shai Hope. While Samuels found runs difficult to come by, Shai Hope kept the score ticking over from the other end. His soft touches and smart batting saw his score accumulate. The pair posted the highest WINDIES partnership of 39 runs together. Mohammad Saifuddin sent Samuels stumps catapulting out the ground as he bowled him for 19. Hope dug deep and played defensively while managing to add to the total. Shimron Hetmyer faced 6 deliveries before Mehidy trapped him LBW without scoring. With wickets falling all around him, Hope kicked into a different gear. He waited for the few bad deliveries and mis-fields to come and took advantage of them. Rovman Powell’s miserable time with the bat continued but it was not without controversy. With 6 men on the leg-side which should have resulted in a no-ball being called and free hit given, Powell instead found himself walking back to the dressing room, caught behind for 1. Roston Chase made 8, while Fabian Allen added 6. Once again Keemo Paul stuck around with Hope and they posted a 28-run partnership. Paul took advantage of having a quick running partner, when he couldn’t get boundaries or sixes, both him and Hope took twos and singles to get the WINDIES to a respectable score. All the while, Hope was blistering the Bangladesh bowlers, he struck 9-fours and 1-six to bring up his second successive ODI century of this series. Going for a big heave, Paul was bowled by Mashrafe Mortaza for 12. Kemar Roach was LBW by Mashrafe for 3. Devendra Bishoo stayed with Hope until the end of the innings, however, in the final over, Hope was struck on the front of his helmet. He sought some medical attention from the physio and batted out the innings, finishing on 108 not out. The WINDIES 198/9 from their 50 overs. Shai Hope 108 not out, Marlon Samuels 19. Bowling for Bangladesh Mehidy Hasan Miraz had figures of 4/29, while Mashrafe Mortaza had 2/34 and Shakin Al Hasan 2/40. The Bangladesh batsmen made easy work of the reasonable total. Liton Das and Soumya Sarkar were the two wickets to fall. Das for 23, while Soumya had a 131-run partnership with Tamim Iqbal before falling for 80. The WINDIES missed the fierce pace of Oshane Thomas who was rested. The bowling attack was dealt a further blow when Kemar Roach hobbled off the field with the physio. An examination revealed the issue to be hamstring spasms which needed rest and icing. Shimron Hetmyer kept wicket after Shai Hope was placed under observation due to the blow received on his helmet while batting earlier. Both Roach with 3 overs bowled and Hope played no part in the WINDIES defense of their small total. Mushfiqur Rahim joined Tamim and the pair took Bangladesh to victory in 38.3 overs. Tamim finished not out on 81, while Mushfiqur was on 16 not out. Keemo Paul took both Bangladesh wickets, finishing with figures of 2/38. Mehidy Hasan Miraz for his 4/29 was Player of the Match, while Shai Hope who amassed 297 runs for the series was Player of the Series.